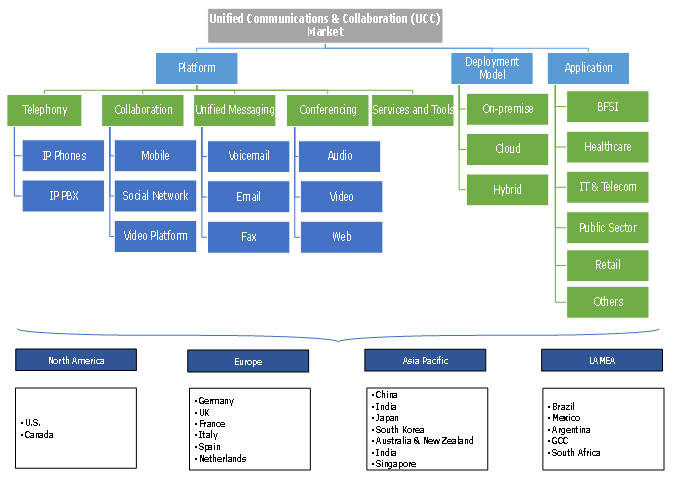 Unified Communications and Collaboration (UCC) Market size estimated at over USD 32 billion in 2018 with a CAGR of 8% from 2019 to 2025. The growing penetration of smartphones and large-scale investments by telecom players for modernizing communication network infrastructure are expected to facilitate the consistent growth of the UCC market during the forecast timeline. A widespread global network of 4G connectivity and the ongoing investments for early commercialization of 5G networks will contribute largely to the uptake of modern enterprise communication solutions. The need for streamlining enterprise communication functions and the growing popularity of the BOYD trend are expected to support the growth of the UCC market during the timeline. As enterprises are rapidly expanding their presence to newer geographical marketplaces, the effectiveness of synchronous & asynchronous communication functions plays a vital role in ensuring a positive outcome of business processes. Enterprises adopt UCC solutions to modernize their communication infrastructure under a unified framework. As BYOD has shown promising outcomes in terms of increased employee productivity and significant IT cost savings for enterprises, these solutions are further enhancing its value proposition in terms of seamless connectivity with mobile resources. Telephony is expected to hold a significant share of the unified communications and collaboration market by 2025 owing to the extensive usage of telephony applications for facilitating real-time enterprise communication with internal as well as external stakeholders across the enterprises. Within the telephony market, IP phones will secure a significant share over the timeline as they serve as multimedia endpoints to bring capabilities such as voice into data and video applications. The conferencing platforms are expected to register the fastest growth over the forecast timeline with a CAGR of over 12%. Some of the key advantages of conferencing solutions in enterprise communication functions are better business relationships, employee satisfaction, improved competitive advantage, and enhanced communication. The solutions also enable faster problem-solving and increased innovation among employees. 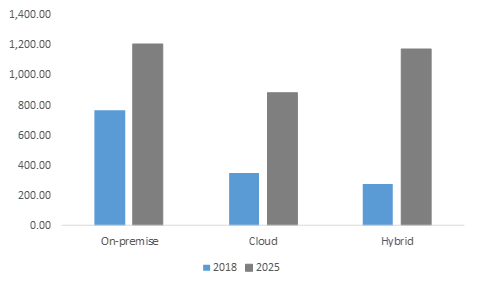 The on-premise model held a major share of over 55% in 2018, whereas cloud-based applications are expected to witness high acceptance over the timeline owing to increasing proliferation of cloud networks. SMEs can benefit largely from cloud-based UCC solutions as they can reduce/eliminate huge capital expenditure incurred on procuring hardware components for enterprise communication functions. Hybrid model in UCC market will grow with over 15% CAGR between 2019 and 2025 as enterprises rely on combined capabilities to enable cloud-based communication functions while maintaining critical data on-premise owing to security and confidentiality concerns. Hybrid models offer flexibility of cloud platforms to scale resource consumption as required while at the same time, allow regulation compliance by enabling secured storage of valuable data. IT & telecom will dominate the UCC market by 2024 with a market share of over 33% owing to the rapid adoption of the technology to seamlessly connect global business locations to enable effective team-collaboration and deliver enhanced customer experience. An increasing number of SMBs operating in the IT sector are leveraging the technology to save considerable cost on IT infrastructure & maintenance by adopting unified frameworks for managing different communication functions. 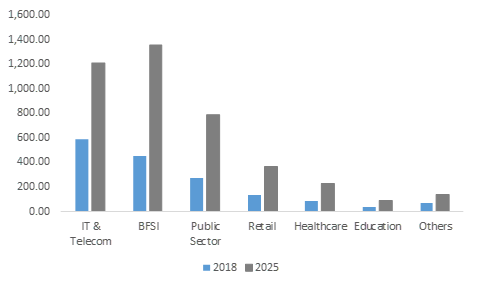 The BFSI market, on the other hand, will grow at the fastest rate between 2019 and 2025 owing to the information-based nature of financial institutions’ services, benefiting immensely from UCC solutions. Moreover, reducing latency in terms of decision-making related to critical customer-facing business processes, such as interactions with high-value customers and mortgage applications, becomes highly efficient using UCC applications for these enterprises. With the growing popularity of mobile banking solutions, there has been a significant increase in the number of people using their smartphones and other mobile devices for banking purposes. Financial institutions are focusing on exploring new communication channels to better serve their customers while enhancing customer engagement. 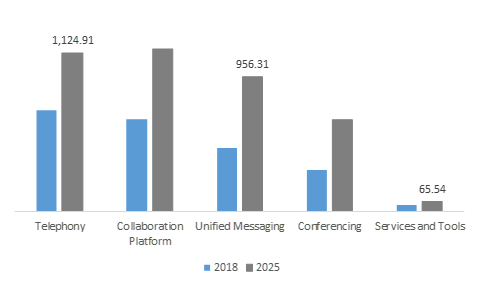 North America is projected to dominate the UCC market by 2025 owing to the availability of advanced communication and IT infrastructure in the region, especially in the U.S. unified communications and collaboration market. Also, mobility witnessed robust growth in North America with accelerated proliferation of mobile devices leading to a favorable environment for the adoption of the technology. American employees are ahead of their global peers in terms of BYOD adoption, which prompts the enterprises to leverage this mobile infrastructure for collaboration functions. 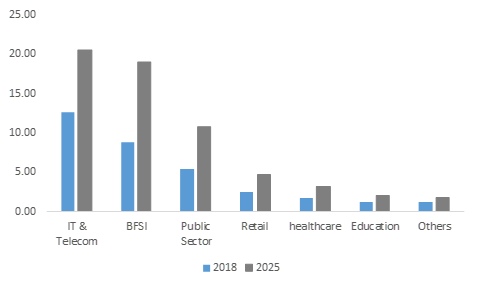 The Asia Pacific UCC market is projected to exhibit the fastest CAGR during the timeline as there is an increasing emphasis on simplification and lowering the cost of communication infrastructure in the region. Also, an increasing trend in the availability of low-cost smartphones is being observed in countries including China and India due to the entrance of new manufacturers in the market. This will further facilitate the adoption of UCC solutions in the region over the forecast period. The key players operating in the UCC market are focusing on new product development strategies to strengthen their product portfolio and increase customer acquisition. For instance, in July 2018, Yamaha Unified Communication announced a new partner program. The channel partner program was made available to the authorized Yamaha Unified Communication partners in North America, Europe, the Middle East, Africa, and Asia. The program’s members have access to critical tools, resources, and expertise designed to increase business recognition and growth. Also, acquisitions are enabling further consolidation of the market as the key players are strategically acquiring companies that can complement their existing product line and enhance its value proposition. For instance, in March 2018, Plantronics entered into a definitive agreement to acquire Polycom in a cash and stock transaction for USD 2 billion enterprise value. The acquisition was aimed at accelerating Plantronics’ vision of offering innovative UCC capabilities to its customers. Some of the players operating in the industry are Avaya, Mitel, Microsoft, Cisco, NEC, ALE, Huawei, Unify, RingCentral, BT, West, 8x8, Orange, Verizon, Google, Nextiva, Genesys, Star2Star, and Vonage. UCC technology has revolutionized enterprise communication by allowing organizations to streamline different communication modalities, such as voice, video, instant messaging, and email, to improve business productivity and enhance customer satisfaction. SMEs benefit more from the technology in terms of reduction of infrastructure costs by integrating IT infrastructure and telecommunication services in one unified framework. As the market is nearing consolidation, the key vendors are aggressively expanding their customer base through strategic acquisitions along with distribution partnerships with various regional players. Moreover, small players are entering the market with cloud and hybrid model to capture the untapped market for developing economies.